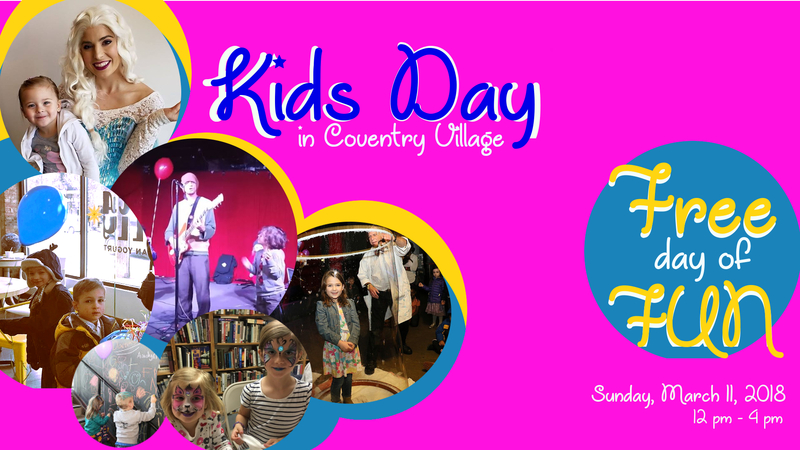 Family fun in Coventry Village. Sunday, March 11th from 12 pm - pm. All events and activities are FREE! 12p - 2p: Bubble Party! @ Piccadilly Artisan Yogurt: Guinness Book of World Records holder, Dr.U.R Awesome will put kids in a giant bubble! Snap a photo. 2:30: Storytime & Fun! @ Cleveland Heights-University Heights Public Library Coventry Branch. --- Join us for cookies and juice as we read stories, sing songs, and play games during a special storytime. 1p - 3p: Face Painting! @ Cleveland Candle Company Artist, Andrea Howell will paint kids faces with fun spring designs. 1p-3p: Kids Crafts! @ Mac's Backs-Books On Coventry Kids can make an origami bird mobile AND a rabbit -or- flower origami book. 2p - 4p: Moana Dance Party & Kids Hula Lesson @ Grog Shop Kids DJ / Dance Party + Special Guest, Moana will be here to teach hula dance lessons and take pictures! Big Fun: 50% off all items. Mac's Backs-Books On Coventry: 20% off all children's and young adult books. Plus --- Complimentary balloons for kids (while supplies last) and discounts for the entire family all over Coventry Village.